We recently had the opportunity to attend a screening of the highly anticipated movie, Divergent. As a big fan of YA (Young Adult) Fiction, I’ve read the entire trilogy and looked forward to seeing how it would translate onto the big screen. 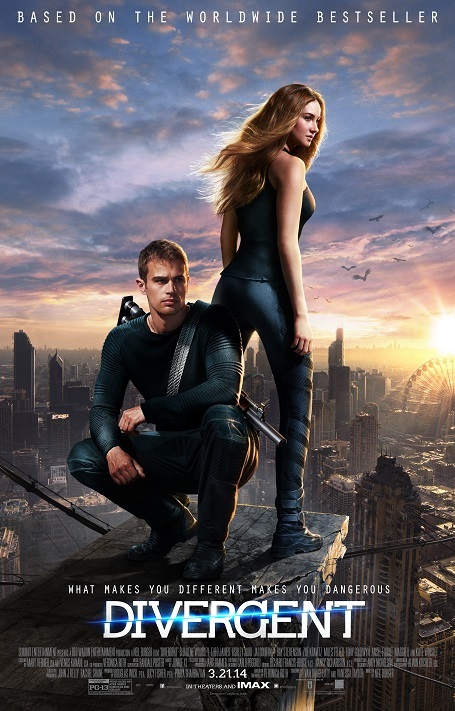 As a fan of Divergent (the book) I was excited to see how the characters would come across on the big screen. For the most part, I think they did a good job sticking to the book. That said, I definitely felt like they could have spent far less time on the training scenes and more time on the final conflict. As a reader, I felt the book was fast paced. But as a viewer, there seemed to be several moments that lacked that nail-biting speed and I felt the difference. There was also the issue of Janine Matthews, who in the book, is a surprise and a bit of a wild card. Yet in the movie she is a known villain throughout. I thought this took some of the suspense out of the story even though Kate Winslet definitely played the part well. The other main characters were well cast with the exception of Tris. I felt her character was a bit off. Her stature didn’t seem as frail as the book described, yet her personality was softer. Four absolutely nailed it and if you had been in the theater with us, you would know the majority of viewers agreed. He was definitely the highlight of the movie. I would also liked to have seen more of the supporting cast. If you like the series, are a teen, or plan to take your older children to this film, it was entertaining even if slow at times. If you haven’t read the book, there are plenty of enjoyable scenes and side plots to keep your interest. If you have read the books, you may find yourself stuck in a vicious cycle of “compare and contrast” as I did. That said, I definitely prefer to see action films on the big screen so I wouldn’t say skip it. Just have a good time and enjoy the show. Divergent is rated PG-13, is open in Theaters nationwide and is 2 hours and 20 minutes long. Disclosure: I was admitted to this screening at no cost for the purpose of facilitating this review. All opinions are my own.